Ladies Black T Bar Block Platform High Heel Sandals Shoes Size UK 3 4 5 6 7 8 Uk5/euro38/aus6/usa7 Koi . Ladies Black T Bar Block Platform High Heel Sandals Shoes Size UK 3 4 5 6 7 8 Uk7/euro40/aus8/usa9 Koi . Ladies Black T Bar Block Platform High Heel Sandals Shoes Size UK 3 4 5 6 7 8 Uk6/euro39/aus7/usa8 Koi . 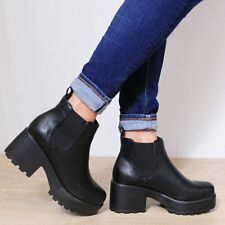 ladies ankle boots size 5. Real leather. Lace up, worn in excellent condition. Condition is Used. Dispatched with Royal Mail 2nd Class. Z.Suo Womens Boots Size 4.5. used and worn, especially on the soles-see pictures. Very comfortable ankle/mid calf brown boots. Genuine leather & suede with faux fur inner lining within boots. Lace ties on the back of boots. Condition is Used. Dispatched with Royal Mail 2nd Class. Ladies Black Leather Buckle Boots Size 5 - never worn -. Condition is New with box. Dispatched with Royal Mail 2nd Class. Ladies Linen And Black Leather Boots 7. Condition is Used. Dispatched with Royal Mail 2nd Class. Men's Leather biker style fetish boots - Size 42 - Black. Condition is Used, hardly worn. Dispatched with DHL from Germany - buyer to pay postage. Boots are in a good condition. Condition is Used. I don't know the make of these boots. They do have the leather symbol inside. Dark reddish colour, black padded portion around the ankle, soles are in very good condition. Small scuff marks on boots, nothing much, on the whole very good condition with lots of wear in them. Very good quality brown leather ankle boots, size 38. Ladies Pale Tan Ankle Boots 7/40. Lovely soft leather.